This great seafood restaurant is among one of the favourites in Alexandria. Hood Gondol serves fried squid, perfectly cooked fish, shrimp soup and much more. Set on two floors the restaurant is large and bustling. 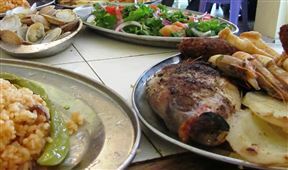 The food is unpretentious but hearty and tasty and an authentic Egyptian atmosphere can be enjoyed here. Hood Gondol Seafood is 0.5km from the centre of Alexandria (Egypt) , the nearest airport 3040.2km (Lokichoggio Airport).